Every year thousands of people get into real, life-threatening difficulty on our coasts. They may be washed out to sea, pulled under by a strong rip current, or simply get into the water when conditions are dangeorus. To ensure you and your family don’t put yourselves in danger we have compiled some simple steps you can take to stay safe on the beach. Rips are strong currents running out to sea that can easily take swimmers from shallow water out beyond their depth. They are especially powerful in larger surf, but are also found around river mouths, estuaries and man-made structures like piers and groynes. Relax – Stay calm and float. Do not swim against the current, swim across it. Raise – Raise an arm to signal for help. If possible shout to shore for help. Rescue – Float and wait for assistance. Do not panic, people drown in rips because they panic. Obey directions from the lifeguard. Keep an eye on tides. Always check the tide before you enter the water. If you are not sure, check with a lifeguard. Never think it is safe to wave dodge. The sea is unpredictable and what looks like fun could end in tragedy with large waves taking you out to sea. The RNLI has launched two short films as part of a campaign to highlight the dangers of tombstoning. 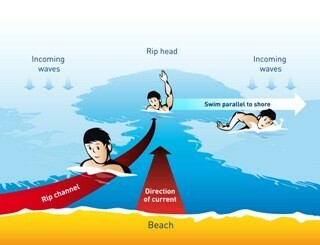 Strong currents can rapidly sweep people away. As a rule of thumb, a jump of ten metres requires a depth of at least five metres. When buying a bodyboard, always purchase a leash and flippers. Always use your board on alifeguarded beach and board in between the red and yellow flags. If you get into trouble, never abandon your board – it will keep you afloat. Wave your hand and shout for help. If you are hiring a board, aim to use a member of the Surf Hire Safety scheme. Inflatable toys are great fun in pools, but we strongly advise against using them in the sea, as there is a high chance of being swept out. Always use inflatables on a lifeguarded beach, in between the red and yellow flags. Never use an inflatable when the orange windsock is flying – this indicates an offshore wind, that could carry you out to sea. Never use an inflatable in choppy sea conditions. Children’s inflatables should always be secured with a line, held securely by an adult. The RNLI’s volunteer crews give up their time and comfort to carry out rescues in difficult and often dangerous conditions. Training is vital to allow volunteers to go to sea and save lives.